You’ve probably played the game where you try to spot different shapes or animals in the clouds. Clouds are good for that because they come in all different shapes and textures, from puffy, low-hanging cumulus to wispy, high-altitude cirrus , all created by liquid moving through the atmosphere. But scientists look to clouds for a different reasons. They can tell us about the dynamics of the atmosphere and the physics of water droplets on a tiny scale. NASA’s PMC Turbo mission sent up a balloon to capture images of one of the rarest clouds, polar mesospheric clouds. These clouds, called noctilucent clouds, only form during the summer 50 miles up in the atmosphere, and they nucleate around meteor dust. David Fritts, who is principal investigator on the PMC Turbo mission, and Gary Thomas, an atmospheric scientist, explain what these clouds tell us about climate change and the physics of gravity waves and turbulence. Check out some images of the rare clouds below. which is headquartered in Newport News, VA.
Gary Thomas is co-investigator of NASA’s Aeronomy of Ice in the Mesosphere mission and a professor emeritus in the Laboratory for Atmospheric and Space Physics at the University of Colorado, Boulder in Boulder, Colorado. IRA FLATOW: You’ve probably played the game where you try to spot different shapes or animals in the clouds. Clouds are good for that because they come in all kinds of different shapes and textures, from puffy cumulus to wispy cirrus clouds. Just last week I saw my first flying saucer cloud, the lenticular cloud. But scientists look to clouds for a different reason. They can tell us about the dynamics of the atmosphere, the physics of water droplets on a tiny scale. NASA sent up a balloon to capture images of one of the rarest clouds, something called electric blue, or polar mesospheric clouds. They form way up in the sky, 50 miles up, and start around, well, specks of meteor dust for nuclei. My next guests are here to tell us about these elusive electric blue polar mesospheric clouds. Let me introduce them. David Fritz is the principal investigator of NASA’s PMC turbo mission, and founder and manager of Global Atmospheric Technologies and Sciences Inc, which is headquartered in Newport News, Virginia. Gary Thomas is co-investigator at NASA’s aeronomy of ice in the mesosphere, and professor emeritus of atmospheric sciences at the University of Colorado in Boulder. Welcome, both of you, to Science Friday. DAVID FRITZ: Thank you, Ira. It’s good to be with you. IRA FLATOW: Nice to have you. Gary, there are many names for these clouds. Electric blue, polar mesospheric, “nautalucient–” did I get that right? IRA FLATOW: Oh, “noctilucent.” Join the crowd of words that I have mawed. What do they look like? Can we see them here in New York? How do you find them? GARY THOMAS: No, I think you have to go up past the Canadian border, roughly 50 degrees latitude. Also you need to go up in summertime and stay around until dusk, or get up very early on in the morning to see them, because they’re very thin so you can only see them when the sky background is dark. IRA FLATOW: Oh, that’s interesting. And are they really electric blue? GARY THOMAS: Well, yes, but really it’s just scattered sunlight. But they appear that way because of the black background. They appear almost luminous. They almost look like they’re a emitting light themselves. But they’re not, they’re just scattered sunlight. IRA FLATOW: Gotcha. In the past, there’s been some debate about how these clouds form. Maybe from meteorite dust, is that right? GARY THOMAS: Yes. I think maybe Dave Fritz could talk a little bit more about that. DAVID FRITZ: Well, the meteors come in. They ablate at high altitudes. They lead to many, many very tiny particles. And because their sedimentation is so small, it takes a very long time for them to settle out of the atmosphere. So nucleation sites are preferred locations for the creation of water droplets and ice particles. So when the temperature is sufficiently cold, that happens readily. Now what’s really unique about this portion of the atmosphere is that, even though it is continuously illuminated by the sun during the summer at high latitudes, it’s by far the coldest place on the planet. IRA FLATOW: You know, it’s hard to think of clouds that develop 50 miles up. Isn’t that like at the edge of space? DAVID FRITZ: Some people consider that to be the case, yes. But they’re very tiny particles. And so they are buoyed up. They maintain their altitude to some degree by the larger scale atmospheric dynamics that cause upwelling of the atmosphere, so there is a sort of a 5cm per second general upward flow. So that helps preserve the particles at those altitudes. IRA FLATOW: Now I want to ask you, Dave– you came up with this idea sort of serendipitously because you noticed there was gunk on a camera? IRA FLATOW: That’s the scientific term, right? DAVID FRITZ: Yeah, that’s very scientific. Gary and I have a colleague who is now deceased, but he did the really pioneering studies of noctilucent clouds, really, 60 years ago. He actually did stereo viewing from the ground, but his cameras were, of course, not what we have available to us now. And he remarkably identified the key dynamics and the altitude and other things that were proven later on. But what is really exciting about this particular cloud layer is that it is very thin in many cases. So it acts as a really spectacular tracer for really small scale motions in the atmosphere that would seem insignificant, but are really, globally, very important. DAVID FRITZ: They are way, way above the jet stream. IRA FLATOW: I’m trying to get an idea for our listeners exactly how high this. These are very high. DAVID FRITZ: Right, so the jet stream is sort of at aircraft altitudes. So commercial aircraft fly at around 11 kilometers. 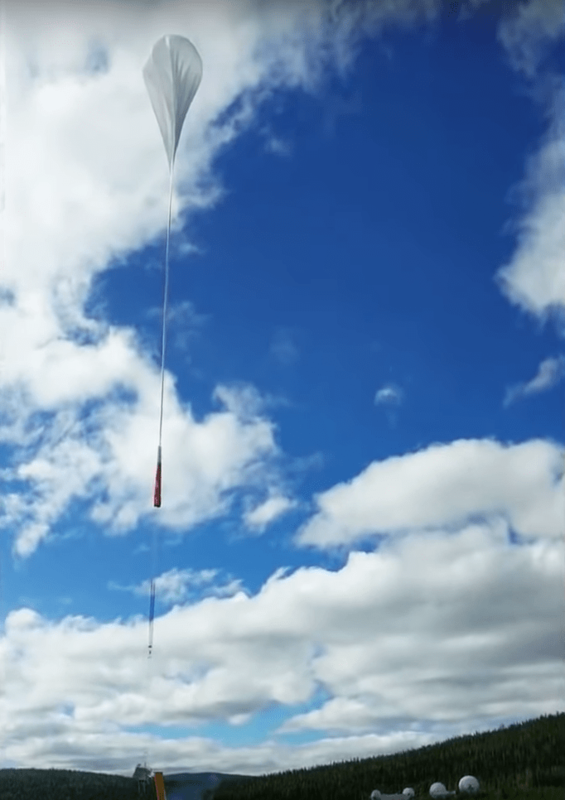 Our balloon mission flew on a high altitude balloon at 38 kilometers, so three times higher. And it had to look up another 50 kilometers to see the PMCs above it. IRA FLATOW: So why are you so interested in these clouds/cloud layer? DAVID FRITZ: Well, I’m a physicist. My passion is small scale waves and instabilities that transition to turbulence. What is really remarkable about the PMC layer are at very high altitudes is that I would argue that although it is very remote, it is almost certainly the very best place to study those processes on the planet. IRA FLATOW: Gary, are you interested for the same reason? GARY THOMAS: Well, sure. The physics certainly excites me, too. I’m a physicist, but I am also interested in the aspect of climate change, because there is pretty strong evidence now that these things have not been around for a long time. In fact, in 1885, they were first reported in the literature. We’ve looked at a lot of reports, going back into the 19th century, and no reports whatsoever of anything resembling this kind of phenomenon. So our idea is that these clouds are actually produced by methane, or at least indirectly caused by methane increases, which have more than doubled over the past century or century and a half. Methane is composed of carbon and four hydrogen atoms, and this decomposes in the upper atmosphere to form water vapor, which in turn collects on meteor dust particles. GARY THOMAS: So if methane doubled, that means that the noctilucent clouds also must have doubled. And so another aspect is that, in 1885, there were fantastic red sunsets during that time because of the Krakatoa eruption that occurred two years before that. So we propose that it was the Krakatoa eruption that caused these things to be discovered– “discovered,” in quotes– for the first time. IRA FLATOW: Interesting. This is Science Friday from WNYC Studios. I’m talking with Gary Thomas and David Fritz. So Gary, do you think these clouds can be used as a measure of climate change? GARY THOMAS: Absolutely. The formation of ice is exquisitely sensitive to temperature changes, and also, to a lesser extent, water vapor. So both of those quantities– temperature and water vapor– are changing in the upper atmosphere as a result of climate change. IRA FLATOW: Hm. So, could it get to the point where we see them more, you know, visually for the general public? They get to be so ubiquitous? GARY THOMAS: We predicted that they would advance slowly over the centuries, but it’s a pretty slow increase in activity. So it’s going to take probably another generation before they can be seen. In fact, they have been seen over southern Colorado. Occasionally they do they do make an advance toward the equator. IRA FLATOW: So they might move to the lower latitudes, perhaps? GARY THOMAS: That’s my prediction, yeah. IRA FLATOW: Wow. You know, that would be sort of bitter and sweet. It’s nice to have them, but we’re having them because of climate change. GARY THOMAS: That’s the idea, yeah. DAVID FRITZ: We’d like to live to see that. IRA FLATOW: Yeah. What data do you hope to get out of your NASA mission? What kinds of things do you want to know? DAVID FRITZ: Well, the principle processes that we’re interested in studying are small scale waves. We call them gravity waves. They’re excited by deep convection. They’re excited by airflow over mountains. But they have a unique ability to propagate to very high altitudes very quickly. They communicate energy and momentum upward, so they’re very important in the large scale circulation of the atmosphere. But they can’t deposit the energy or the momentum until they dissipate, and they have to do that by instabilities and turbulence, and those processes are really poorly understood. And one of the motivations for understanding them, and one of the motivations for the various agencies funding these things, is that if we can better understand these processes, we likely will be in a better position to predict weather and climate. So those will be some of the very significant outputs of this down the road, potentially. IRA FLATOW: Wow. So where do you go from here? How do you follow up on this? DAVID FRITZ: Well, we have a gigantic amount of data. We flew seven cameras on the balloon and a lighter that was provided by the German Aerospace Center. So we have really exquisite measurements. We have a suite of seven cameras, four large fields of view, and three narrow fields of view that span a region of the sky from about 100 kilometers across. And the high resolution of the cameras allows us to see scales as small as about 10 or 20 meters. So this is really, I think, a remarkable experiment. It’s the only place, I believe, on the planet where there is the potential to see that much variability. The particularly exciting thing about this mission is it lets us watch the flow of energy from the waves that bring it to those altitudes, all the way through the instabilities and to the turbulence. And it highlights the specific processes by which that happens, which we have a difficult time seeing anywhere else. IRA FLATOW: Well, I can’t sum it up any better than that. David Fritz, principal investigator of NASA’s PMC turbo mission, and Gary Thomas, co-investigator of NASA’s aeronomy of ice in the mesosphere. Thank you both for taking time to be with us today. DAVID FRITZ: Thank you very much. Read the study about the NASA balloon mission that captured the electric blue clouds. Read NASA’s write-up of the findings. Read the AIM Mission Overview. Certain types of bacteria in the atmosphere can play a role in rain and snow.